VALLETTA – 9 March, 2018 – 100 Women in Finance (100WF), a global non-profit organisation that supports more than 15,000 professionals in the finance and alternative investment industries, yesterday celebrated International Women’s Day with a series of events in Valletta with HRH The Countess of Wessex GCVO, Global Ambassador for 100 Women in Finance’s Next Generation initiative and HE The President of Malta. The Countess rang the bell to mark the opening of trading at the Malta Stock Exchange with the President of Malta, before attending a reception for members of 100WF and invited guests. The Countess of Wessex attended the Business Professional Women Careers’ Day at the Mediterranean Conference Centre, and participated in a question and answer session with the students. The Careers’ Day is aimed at showcasing opportunities open to young women in industry, providing mentoring and support. 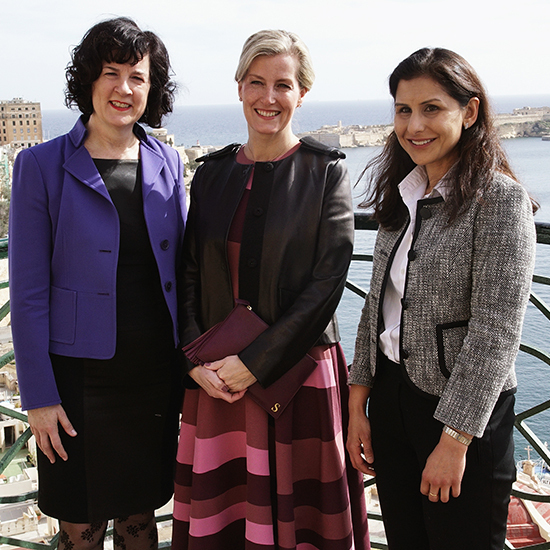 The Countess of Wessex later attended the International Women’s Day lunch sponsored by the Valletta 2018 Foundation and hosted by the President of Malta at the Grandmaster’s Palace. The Countess of Wessex also visited the University of Malta, Valletta Campus and met academic staff and students from the Banking and Finance department. The Countess of Wessex as Global Ambassador for 100 Women in Finance’s Investing in the Next Generation Initiative attended an evening reception hosted by 100WF and sponsored by Catena Media and National Bank of Greece. The reception was also attended by the President of Malta. At the event, Amanda Pullinger, Chief Executive Officer of 100WF, and Elaine Mulcahy, Chair of 100WF’s Malta Committee, gave an overview of the global organisation: its mission and achievements, and looked ahead to programs planned for Malta. 100WF’s Malta location, established in 2016 has more than 145 members. Since November 2015, HRH The Countess of Wessex has been Global Ambassador of 100 Women in Finance’s Next Generation initiatives and has represented 100WF’s Next Generation initiatives as she has traveled to several of 100WF’s locations around the world. As Global Ambassador, HRH serves as an advocate for increased diversity in the financial services industry, and for raising the industry’s visibility and appeal as young women consider career paths. The Countess has also participated in conversations in which she can share 100WF’s global knowledge of best practices around cultivating interest and engagement from the next generation of women entering the industry.